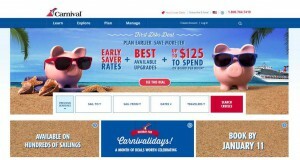 To celebrate the upcoming Wave Season, Carnival Cruise Line is launching a month-long Carnivalidays event with special pricing offers, onboard perks and more. The event runs January 4-31, 2016, with a variety of offers throughout the month, everything from complimentary two-category upgrades and onboard credits to reduced deposits and 24-hour sales with great rates on hundreds of sailings. Offers are available on a wide variety of three- to eight-day cruises to the Caribbean, Bahamas, Mexico and other destinations as well as European sailings on the new Carnival Vista, set to debut in May 2016 operating eight- to 13-day cruises to the Mediterranean. The offers are capacity controlled and certain restrictions apply. For additional information on Carnivalidays, contact any travel agent, call 1-800-CARNIVAL or visit carnival.com.